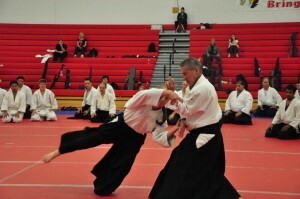 R. Heins taking ukemi for Miyamota Sensei at 2009 Birankai Summer Camp. The Japanese terms “sempai,” “kohai,” and “dohai” may be misunderstood in Western dojos, if they are used at all; likewise, cultural concepts of seniority can be misinterpreted. Literally speaking, “sempai” means “earlier/previous member [of a group]”; “kohai” means “later member”; and “dohai”—used far less often—means “equal member,” and refers to someone who joined the dojo at the same time as oneself. In a martial-arts context, the use of these terms depends heavily on circumstances and the culture of the dojo itself. But it’s important to understand that they relate to relationships within a given group, and that certain expectations and obligations are attached to them.